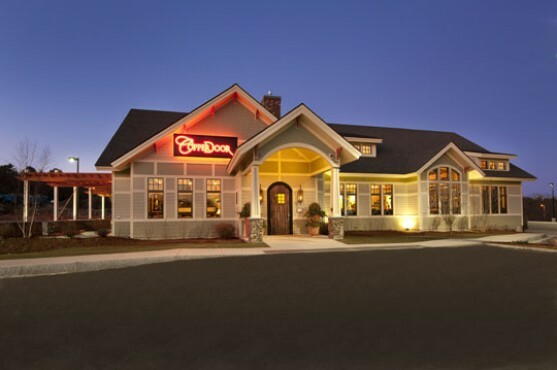 A new food venue developed by Great NH Restaurants. The Copper door theme is presented in the oversized copper clad entrance doors to this 8,000 SF restaurant. The building envelope is a Structural Insulated Panels System (SIPS) with exterior overlay of cementitious siding, trim, and architectural grade shingle roofing. The theme for the building exterior was that it have a “cottage” feel. The nicely appointed interior features a vaulted ceiling with laminated fir trusses with exposed steel elements to complete their functionality as well as aesthetic. The kitchen is open to view from the dining area. In addition to the main dining area and the bar there are two meeting spaces and a trellised outdoor dining area.